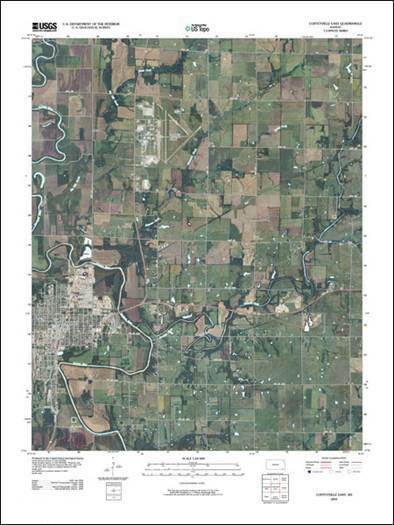 The U.S. Geological Survey (USGS) produces 1:100,000-scale county maps for each of the 72 counties in Wisconsin. These maps show topographic features including contours and elevation in meters, highways, roads and other manmade structures, water features, woodland areas, and geographic names. These maps vary in size depending on the particular county. USGS county maps in Wisconsin were generally produced between 1976 and 1990. The U.S. Geological Survey also produces 7.5-minute quadrangular maps. There are 1154 quads covering the entire state of Wisconsin. For example, it takes 20 quads to cover all of Richland County. Each map sheet measures about 22″ x 27″ although without the border, the ground area on each sheet occupies about 17″ x 23″. The 100K county maps are compiled from these quads. Beginning in 2009, the USGS began to make available the next generation of digital topographic maps under its new US Topo program. National topographic coverage along with the current status of Wisconsin digital topo maps can be found at the USGS Website. Interested in topographic change or looking for just the right topo map for your purpose? Try exploring the USGS Historical Topographic Map Explorer, a USGS web application that offers functionality to query a location for historic and contemoprary topo maps, view available maps on a timeline, as well as overlay and download topo layers. If you are having trouble locating topographic maps in Wisconsin or need further help, please contact us via e-Mail or at (608) 262-3065.